Lady Carrington Drive mountain bike ride is one of you best trails for Beginners. A 20km return trip it’s not too bad for experienced riders as well. The mountain bike track runs along the Hacking River in the heart of the Royal National Park going up stream from Audley. The trail is nice and flat in most parts. The track is wide and well maintained. There is a bit of a hill at the end of the track but it’s not too steep. Most mountain bike riders should be able to peddle their way up. There’s plenty of scenery to take in riding through the rainforest towards the end of the trail. The track covers part of Forest Island which makes you feel like your in the middle of the jungle. There’s a few picnic areas to have some lunch. 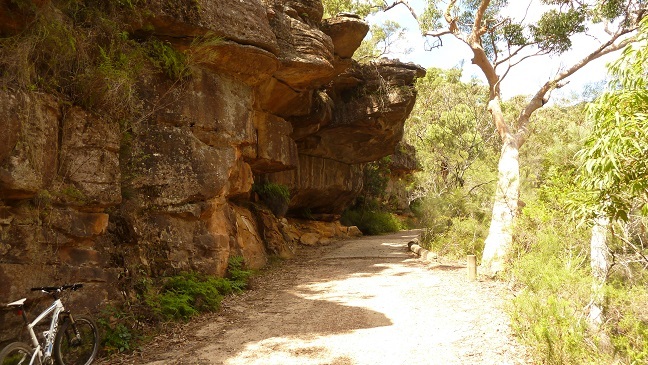 At Palona Brook you can take a short detour to explore a sandstone cave. Though you’ll need to walk so chain your bike up. Directions to Lady Carrington Drive, Royal National Park. Google Map Link. The Trail head starts at Audley. Park your car at Audley and Peddle your moutain bike south until you see a large sign at the start of Lady Carrington Drive. Use the map below to assist you with finding the trail. Lady Carrington Mountain Bike Trail Map. Lady Carrington Mountain Bike Photo Gallery. Lady Carrington Mountain Bike Youtube Clip. Mountain Bike, MTB, bicycle, track, trail, bush, dirt, ride, Sydney, South, NSW, Australia, Royal National Park.